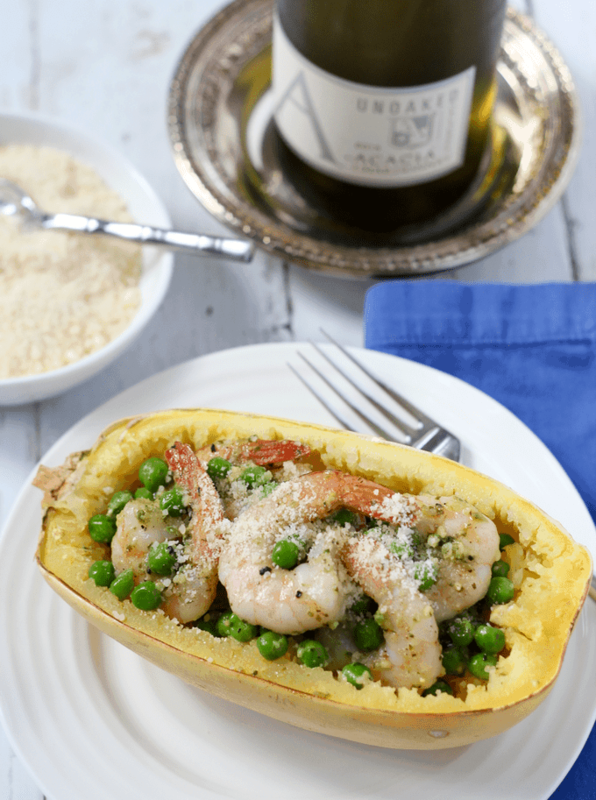 Spaghetti squash with shrimp, peas and pesto is an easy, healthy weeknight dinner! 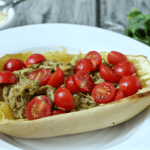 Spaghetti squash is such a fun food. 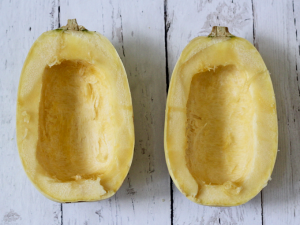 It’s just squash but once you roast it, it really does shred up like spaghetti strands. It has a very mild flavor, so it pairs well with lots of different foods and can be used as a substitute for pasta. It’s gained quite a following due to the low-carb craze. I don’t have a thing in this world against carbs. I eat them often and without a second thought. But I still love subbing this squash for a healthy dinner! 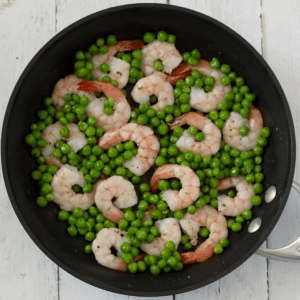 This is an easy dinner to whip together and takes advantage of some freezer staples — peas and shrimp — so it’s good for later in the week before you’ve had a chance to get back to the grocery store. You can use either frozen cooked or raw shrimp, too. 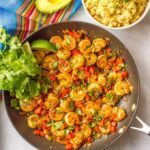 This complete dinner is also just 4 basic ingredients: spaghetti squash, shrimp, peas and pesto. That’s my kind of weeknight easy. 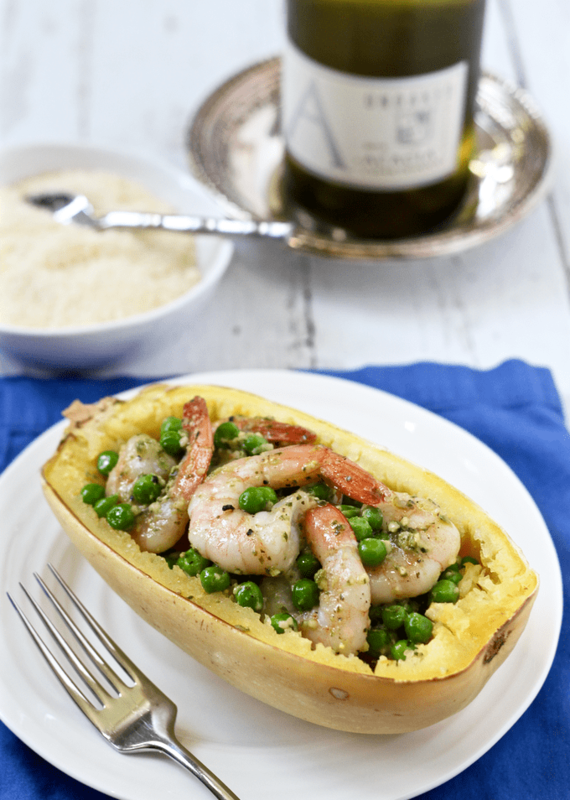 Spaghetti squash with shrimp, peas and pesto is an easy, healthy 4-ingredient dinner! Cook the spaghetti squash: Line a baking sheet with aluminum foil and spray with cooking spray. Cut each squash in half lengthwise. Use a very sharp knife and be careful — they can be difficult to cut. If needed, poke it with a fork and microwave for 4-5 minutes to soften it slightly before cutting. Remove the seeds and inner pulp of the squash (much like cleaning out a pumpkin). 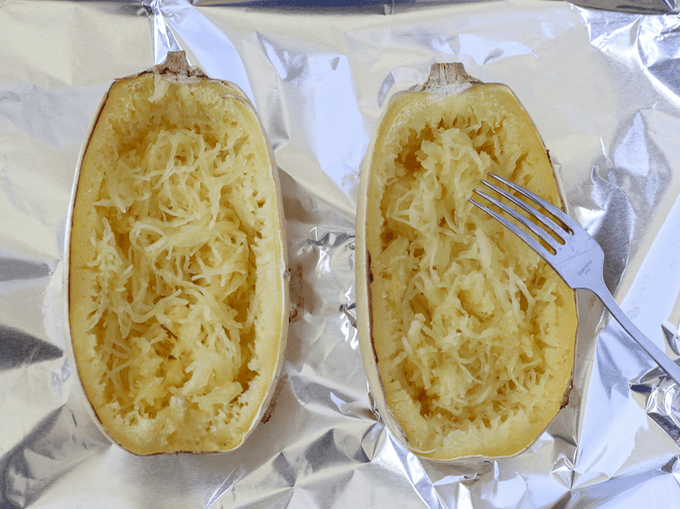 Place spaghetti squash cut side down on prepared baking sheet. Bake for 45 minutes at 375. Meanwhile, thaw the peas and shrimp by running under very cold water for several minutes. If you are using uncooked shrimp, heat the olive oil in a medium saute pan. Add shrimp and cook for 1-2 minutes on each side. 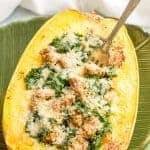 Once the spaghetti squash has cooked and is cool enough to handle, take a fork and pull strands from the outer skin of each squash half. Top the spaghetti squash with the warm pesto-pea-shrimp mixture. Top with Parmesan cheese, if desired. Serve immediately. 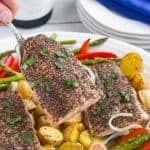 What a great easy dinner recipe! Thanks for linking up with us for Fabulous Foodie Fridays this week, have a great weekend! 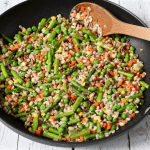 I love an easy dinner… especially when it’s this tasty and healthy! Thanks for stopping by — and for hosting — Lauren! I made this for dinner tonight. So easy and so delicious! 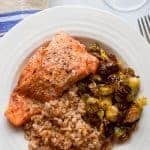 This is a great, simple recipe! Hi Vicky – I’m so glad to hear you enjoyed it! Thanks so much for letting me know! !